First Supply features the products most asked for and used by trade professionals. A.O. Smith and Navien are our exclusive water heater brands that are stocked at First Supply. Contact the First Supply location nearest you for inventory on the specific product you are looking for. A.O. Smith offers a large selection of gas water heater models from our innovative high efficiency designs to our standard energy-efficient units for both natural gas and propane applications. The innovative streak that runs through all A.O. Smith products is also proudly on display in our commercial electric line. With features such as the intelligent control system (DVE & DSE models) and the now standard 24k gold elements (optional on DSE models), our water heaters can sustain that performance even in the harshest water conditions. Built with the highest quality components, our ProLine® XE gas water heaters deliver an industry-leading combination of design and innovation. Most ProLine® XE models are also ENERGY STAR qualified. A.O. Smith ProLine XE models are the water heating industry’s ultimate performers. With their blend of innovation, efficiency and cutting-edge technology, these state-of-the-art electric models provide a long-lasting supply of hot water during those times when everyone in your home needs it most. A.O. Smith offers a line of tankless water heater models, Condensing or Non-Condensing units for both natural gas and propane applications as well as the TX-199 integrated Tankless on Tank water heating system. Permanently eliminate aluminum hydroxide and most smelly water and help extend the life of your water heater tank. The Product Preservers™ Powered Anode System replaces sacrificial anodes which are normally shipped with water heaters. Efficient: The Product Preservers™ Powered Anode System uses patented adaptive technology that quickly adjusts to your water type providing the precise amount of current needed to deliver the best protection for your water heater tank. Reliable: Consistent protection is paramount in maintaining the integrity of the steel water heater tank. Built-in LED fault light and audible alarm provides peace of mind knowing the system is working properly. Simple: Installation is made easy for professionals with a small control box that can plug into any standard 120 volt wall outlet. Patented adaptive technology quickly adjusts to the local water conditions. Eliminates smelly water issues caused by sacrificial magnesium anodes. Protects for years; no maintenance required. Great for softened water applications. *Protection is maintained as long as the control module remains connected to a power source. 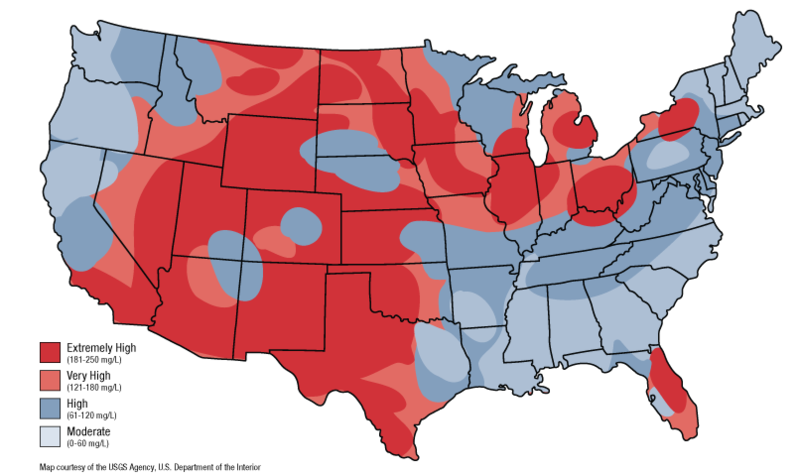 Smelly water conditions typically occur in private wells located within the high water hardness areas shown above. In areas with sulfides in the water, there is a reaction with magnesium anodes which creates hydrogen sulfide gas that produces a rotten egg smell in the water. Smelly water conditions typically occur in private wells located within the high hardness areas shown in the water map below. In other areas with high conductivity water, aluminum anodes create an aluminum hydroxide gel that decreases the efficiency of the heater and quickly depletes the anode leaving the tank unprotected. This next generation of anode provides consistent protection that extends the life of your water heater tank. Since no chemicals are added to the water as with sacrificial anodes, the Powered Anode System will not create smelly water or aluminum hydroxide.